Dancing in The Dockyard was a fantastic event from the way the diverse programme came together to the fact we were tremendously lucky with the weather on the day and I’m very pleased that Luci from the Arts Development Team, Medway Council asked us to be involved with it and would like to say thank you for funding and supporting yet another great Medway dance event! 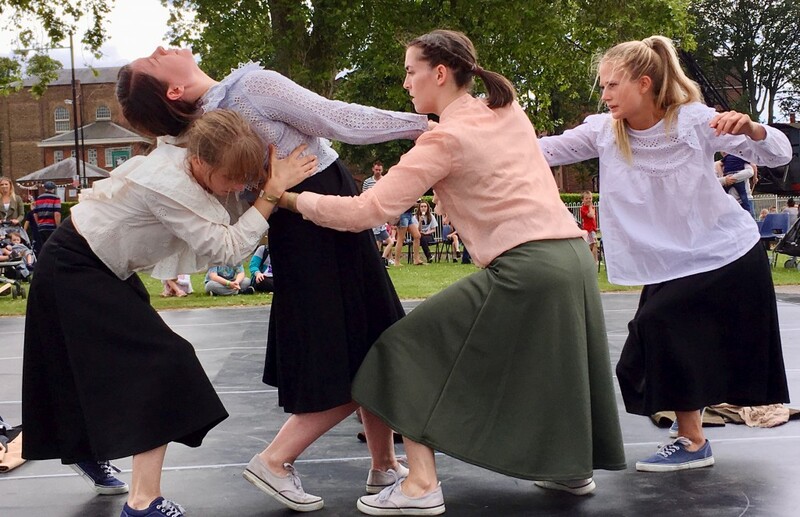 My favourite part of Dancing in the Dockyard is that so many people who don’t usually see dance were part of the audience and that they enjoyed it!! 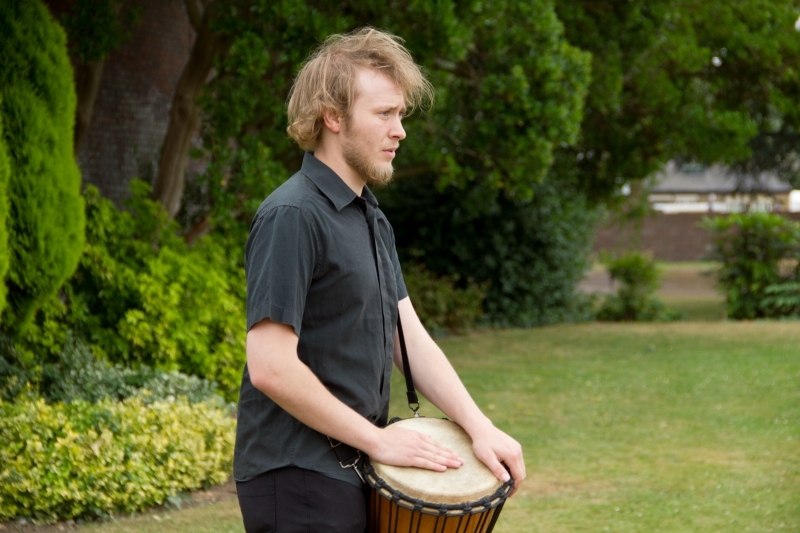 We aimed for a varied programme and the groups of Medway provided it. 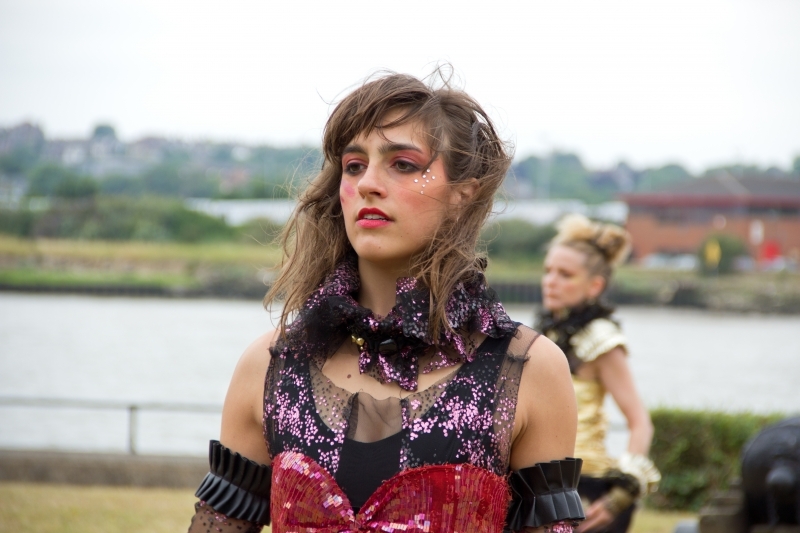 Medway Dance Network helped this along in the early stages of planning and it seemed to come together almost organically. For the, mostly unsuspecting, audience this meant something for everyone. Although I didn’t get to see all of the performances as I was rushing about, I’ve only heard good things and this is testament to the performers. Once again, well done Medway! My least favourite part of the event is that it’s truely a one off, although this is quite exciting too! As The Historic Dockyard is celebrating their 400th birthday this year we certainly won’t be able to join the celebration of something so exciting again (unless we wait another hundred years perhaps! ), but this helped to make the event special. I wish them luck with the rest of their celebrations and I’d like to share that, if you would like to find out what they’re up to this year, you can use the hashtag, #400moments to do so! I’d also like to mention the team behind it all. We did have a lovely day, but it was a busy one and the team worked very hard! The hard work began before the event, of course. Luci was on top of things every step of the way, Clare, our social media guru, was joined by Georgie, Hayley supported me and Georgia helped hold everything together on the day. In amongst all this we also had workshops led by Georgia and Georgie, but due to the sheer size of the audience, we all supported them so that more people could participate. The TRS members of the team have written their own accounts of the event to give you a bit more of an insight. Enjoy! As the Social Media organiser for the event, my work started well ahead of the day, although not quite as early as all the wonderful choreographers creating their fantastic snippets of dance. Early doors, I was working on building an audience for our event and thanks to the brilliant Georgie at the Right Step Dance Company, I had help along the way. In return for giving her a little more insight into the wonderful worldwide web of Social Media, she gave her time to assist me with the creation of our audience both on and off-line. 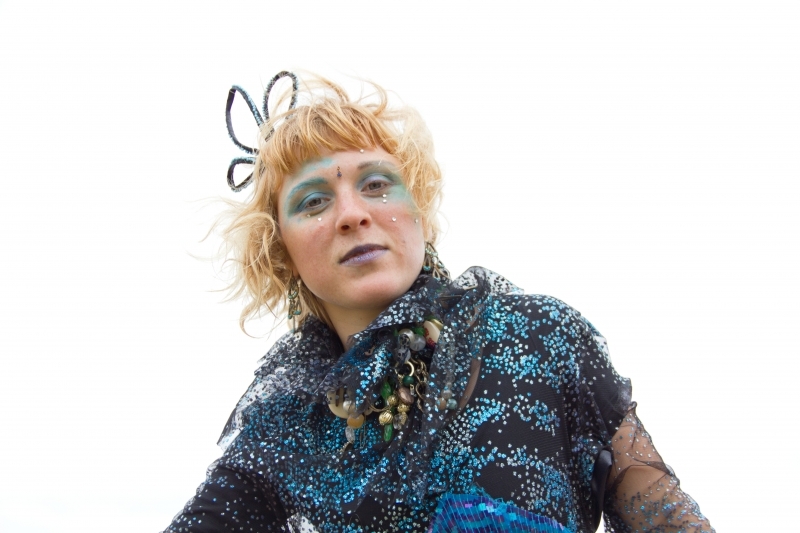 In any event like this, we have to bear in mind that we want to see real live people there on the day, as well as, through the magic of the internet, bringing the performance to those unable to attend. We also have the chance afterwards to remind people of the fabulous day they enjoyed through our sharing of a gallery and some video clips taken at the time. 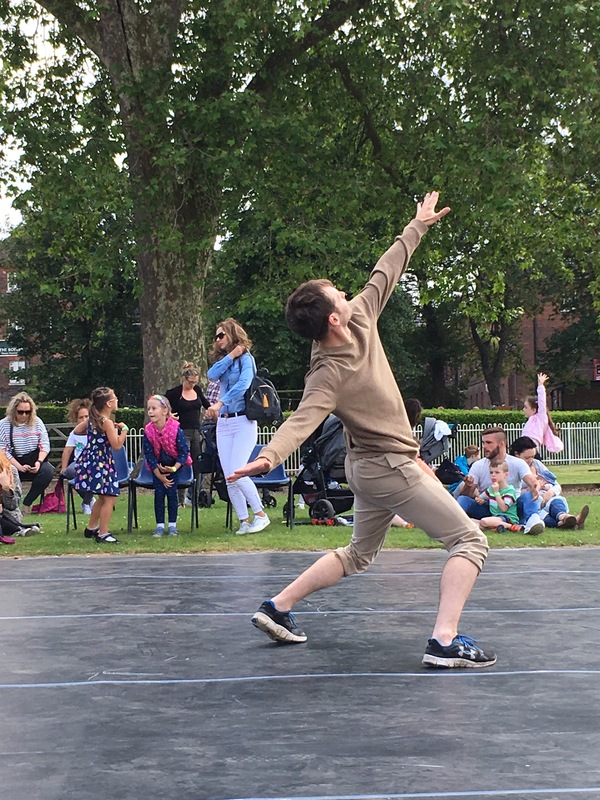 In the weeks ahead of Dance in the Dockyard, we scoured the internet for inspiring dance oriented articles, some of which had an aquatic theme, as well as creating our own count down to the event. We were also able to introduce our audience to the performers ahead of the production. On the day, we had the best job of all, to document and share the performances with our wider audience. So we got to see everything, in detail, several times over, what a luxury. Well I think our work went well, as there were so many people from all walks of life there in the audience, we had children and adults participating with enthusiasm as well as scores of people sitting in the audience watching. We had dancers of all abilities and people of all capabilities too, which was wonderful to think that we were able to open dance up to everyone who attended. I particularly loved the lady with her own collection of toy meerkats who joined in with pretty much every single number and workshop. 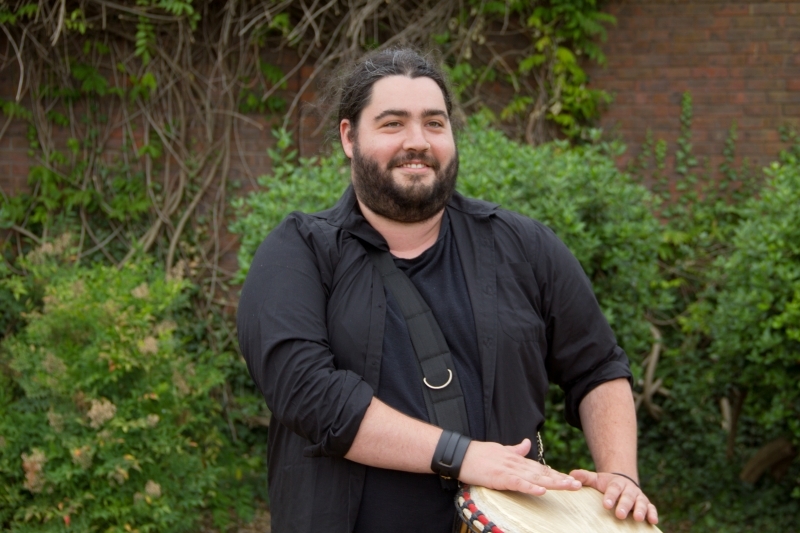 I think we need to shout a big thank you out to our sound team, as the music could be heard across the festival, drawing people towards the music and dance that was occurring. The highlight of my day had to be watching all the participants getting so engrossed with the many dance workshops that were put on that day. I loved the fact that the workshops were all nautically themed, which was so in keeping with our historic location. 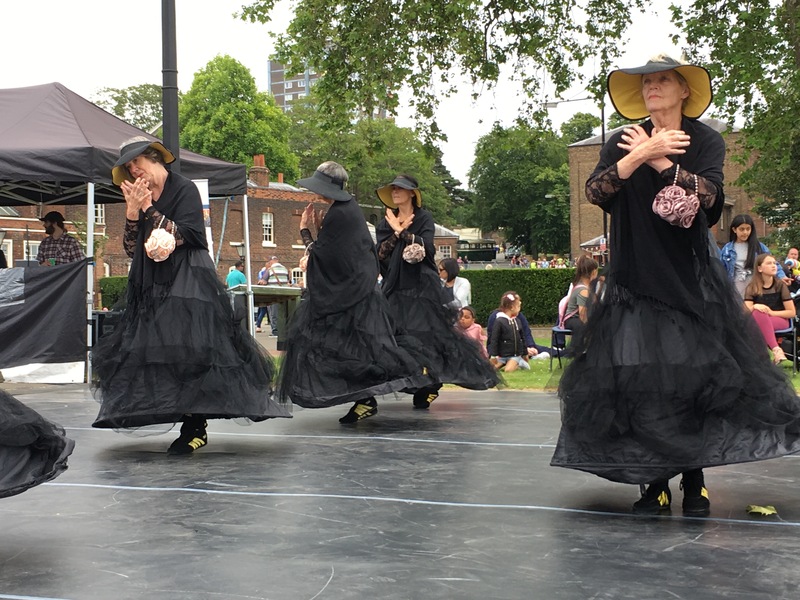 And I learned something, albeit something sombre… The Daisy Farris Dance Collective performed their “Great Thames Disaster”, opening my eyes to this really tragic event that happened on our capital’s river, cutting short the lives of so many, so unexpectedly. On a lighter note, I learned something else too… how to use Facebook live video. And it was really popular! People unable to attend were able to be a part of our event live through the powers of Facebook. What a brilliant innovation. 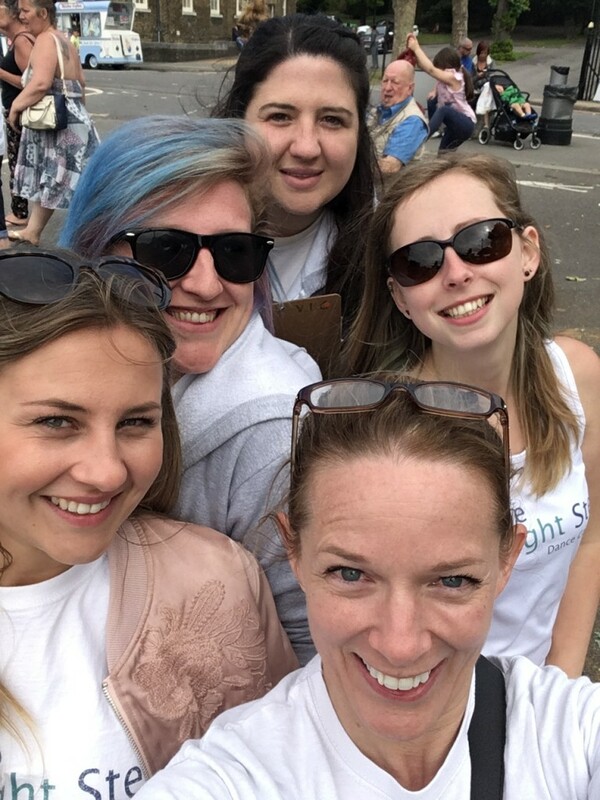 When the day was wound up, I also really liked the fact that one of our most popular social media posts was our team selfie. Here’s to the team. It is always helpful for my development to be part of these events as they are always inspiring and enjoyable, and always present learning opportunities for me. These are public events so you never know how they are going to go or what challenges you will face as a team so it is always good to have the experience of being part of the planning. Effective planning can always reduce risks and can give possible solutions to problems that may come up. 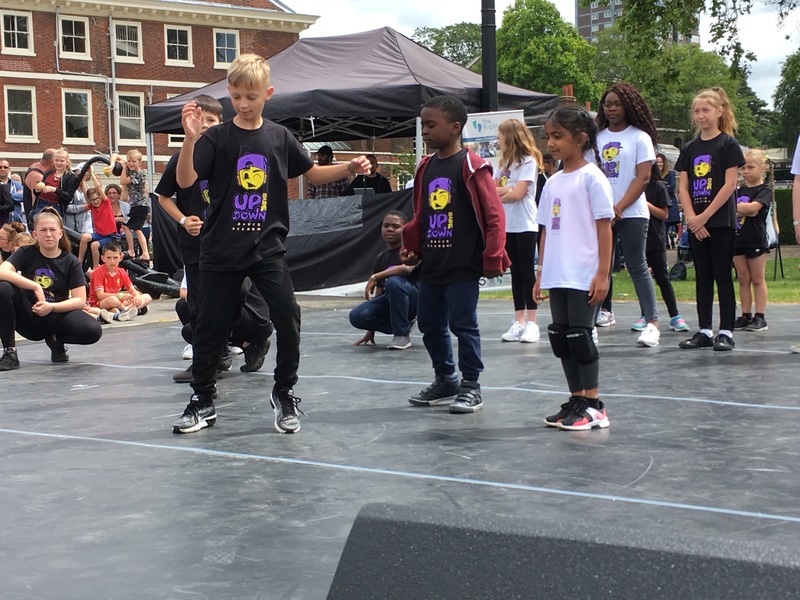 As with all of these kinds of events that I have attended, this was an amazing event organised by a great team in Medway Arts Team and The Right Step Dance Company and any eventuality was planned for. There was such a great buzz around the whole event and the performances had lots of audience members watching and commenting on them. I was concerned the event may not capture a big audience due to having to register but the Dockyard did a great job in making the registration free and easy to do and did a great job in marketing the event and we had a great footfall. I spoke to a family that loved the workshops and hadn’t been to an event like this before and wanted to find out about the classes available. I personally think this is a great success for the companies and dance schools there but also for the promotion of health and wellbeing in Medway. I had a conversation with a teenage boy that came up to me and ask what kind of dance style it was when Loop were performing. This gave me the opportunity to talk to him about contemporary dance and the ideas behind Ports That Pass. 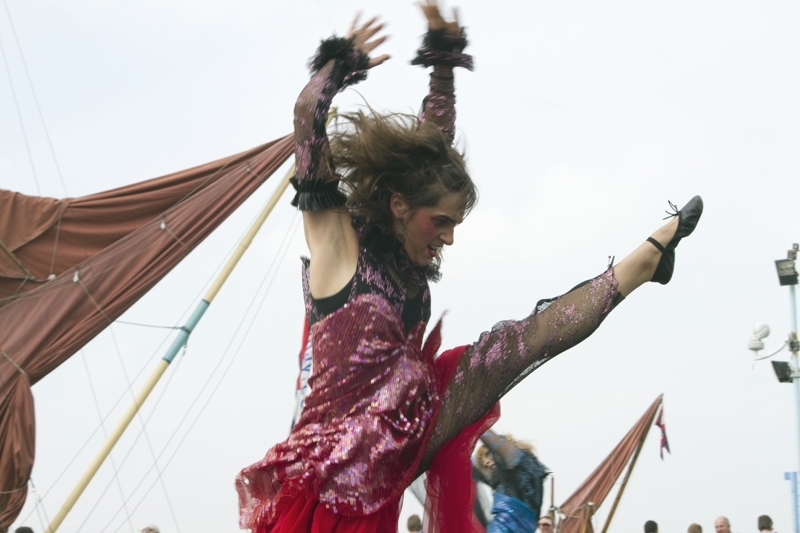 We spoke about possible dance schools that offer this style. I really liked how inclusive this event was and many people with mixed disabilities joined in the workshops. Watching people have the chance to network with each other for collaboration opportunities and to promote their companies and dance schools to the public was really great to see. I really enjoyed delivering the workshop based on boats and the dockyard and was thrilled at the amount of people that were joining in. 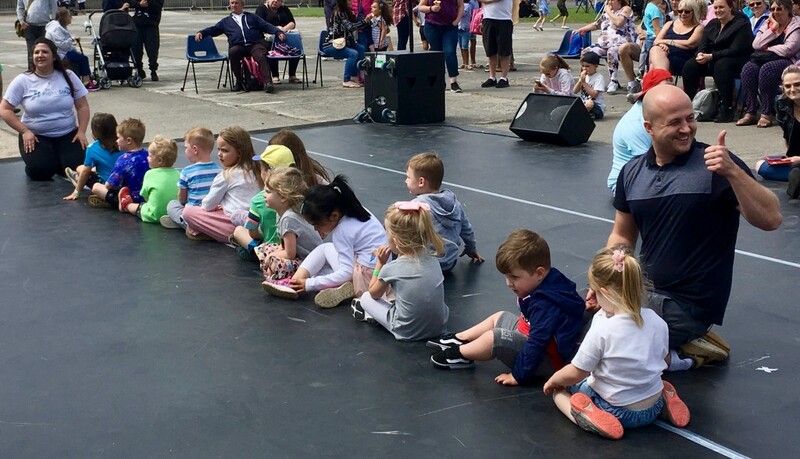 We had 30-40 people including children, adults, families, people with mixed disabilities and abilities, carers and people from different cultural backgrounds joining in and this really made the event for me. 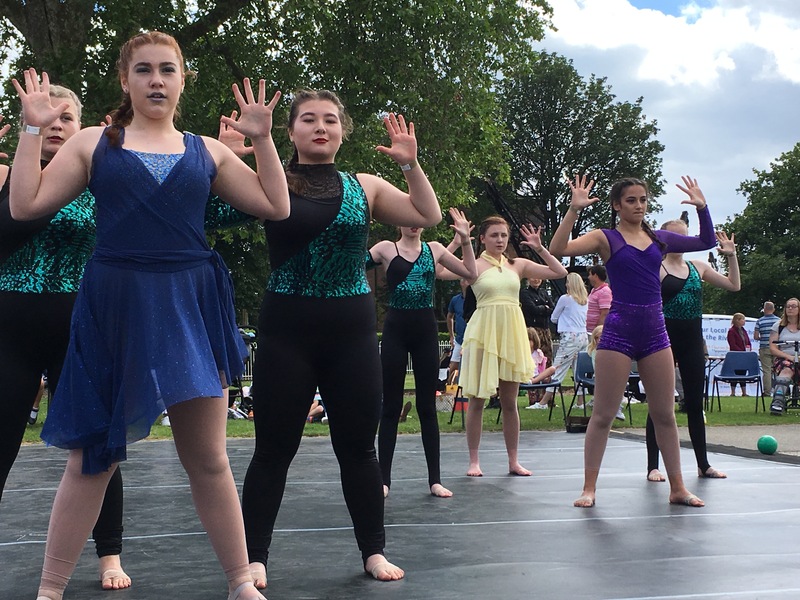 I loved seeing all performances and the range of dance styles and age groups really showcased what Medway can do and what we have to offer! 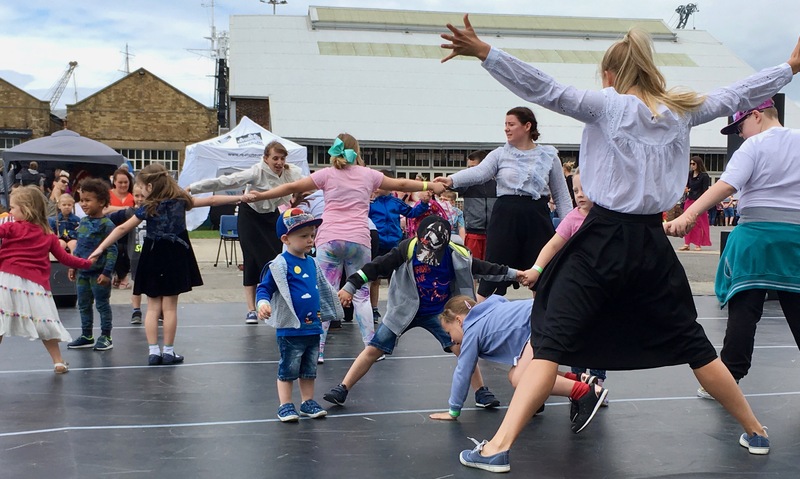 Dancing on the Pier, Dancing in the Dockyard… I can’t wait to see where we will be dancing next time! 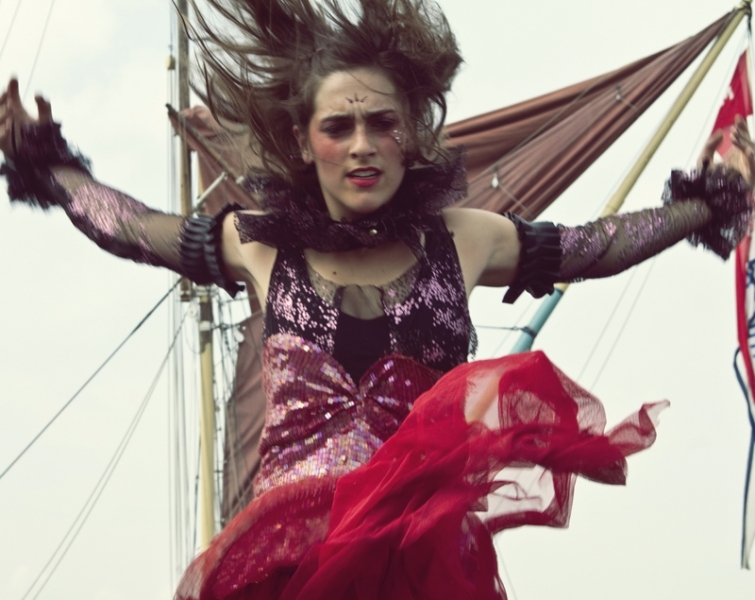 Dancing in the Dockyard was an absolute pleasure to be a part of. I volunteered my time to help organise the event by attending meetings and collating information via email. I decided that this would be a great opportunity to get involved and see what goes on behind the scenes. I have always been a performer in events like this, meaning I had no idea about the hard work it involves creating such a successful event. This is why I jumped at the chance to have the opportunity to be a part of it. 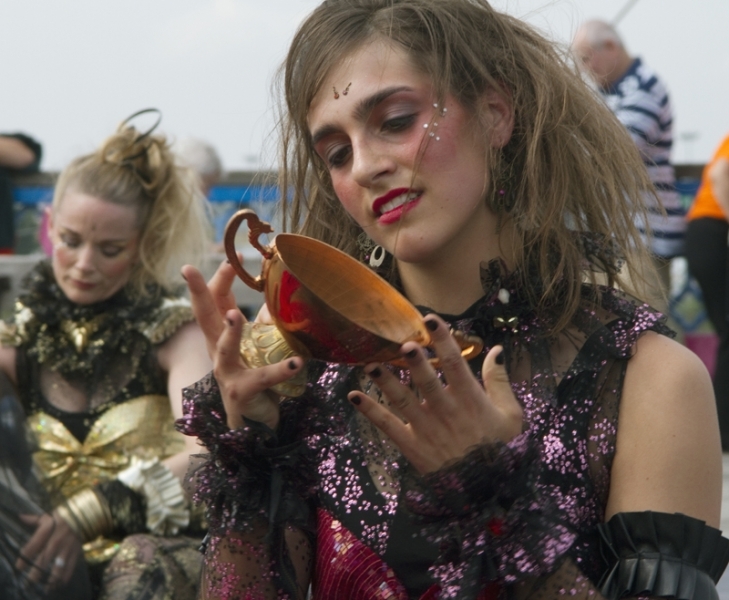 I was able to have firsthand experience on the day dealing with performers, participants, audience members, technicians and Chatham Dockyard coordinators. I was able to talk to the general public and explain what we had to offer on the day, encouraging them to have a look and take part (particularly little ones). I was thrilled to hear how enthusiastic the majority of people were when approached. I heard many lovely comments and received lots of positive feedback through the questionnaires. I had people wait to talk to me and receive a leaflet about Dancing in the Dockyard, a young lady and father explaining how she loved to dance and also she is good at it because she practices at school and with her friends. I also had some young boys show me that they can floss when I spoke to them about the event. Later in the day they appeared again and joined in with Georgia’s creative dance. I had an elderly couple approach me asking about what was happening which I explained, they were thrilled to hear and asked for front row seats. I believe they sat through the majority of the first half of performances. It was brilliant to see how smoothly the day went, particularly when we had the situation with GDPR consent forms. I was overwhelmed at how understanding people were when I explained the importance of the form; many came looking for me to sign the form once Luci explained over the speaker. That worked really well in the end, I think to improve that particular situation in the future we should have a particular spot. This way the parents can come straight to us, rather than we hunt around in the crowd for them. Overall I had a wonderful experience and a great day and the pleasure to work with such a lovely team. Thank you so for having me!! Wow! What a fantastic event. 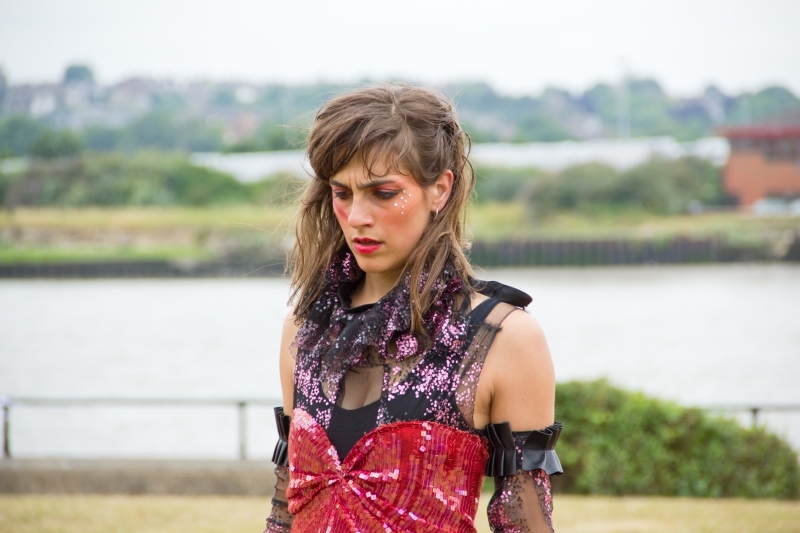 I was really excited in the build up to dance at the dockyard, being in the office and speaking to Clare about social media posts meant I got a sneak preview of what was going to happen. I could see we had a lovely variety of performers, plus workshops too. I thought I was quite prepared for the event, as I had been to a couple of them before… But I definitely was not prepared for the turn out we had! The crowd was huge, I ended up doing the biggest active armchairs session on record which was amazing! I felt such a buzz from the crowd. even though half of the children were too young to know the songs, they were still really enjoying it. All of the companies involved were so talented and to have such a variety was really great. I must admit I did have one of the best jobs, taking the photos for social media meant I got a front row seat! I was so excited, I got a little trigger happy with my camera and took over 500 photos! The support from everyone involved, the team and of course the audience really made the event one I will remember! You can definitely sign me up for next time! 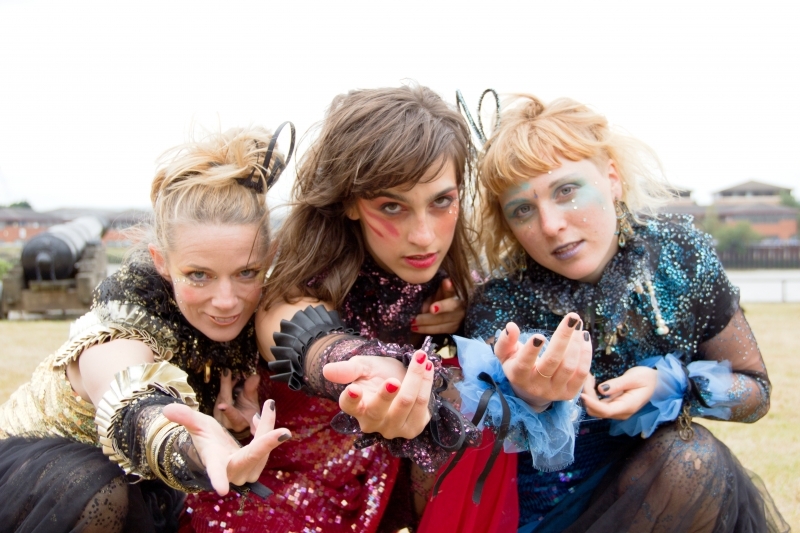 Nikki Price Photography received a private performance from The Sirens of Cetham Team when she came to photograph them before their River Festival and Big Dance performances in July 2014. We’re so pleased she braved the weather because her photos, as always, are fantastic. This album contains just a few of her photos, these are The Faces of TSOC. Keep your eye out as we will post more in the near future. 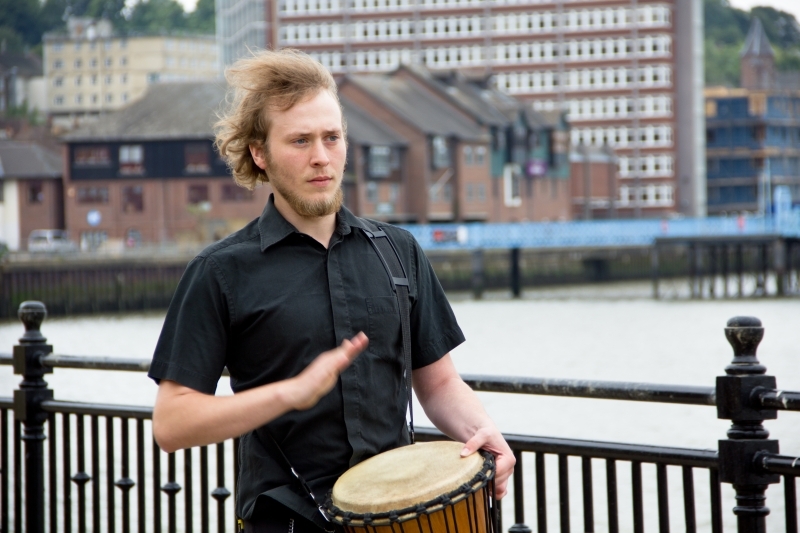 In 2014 Big Dance, The River Festival and Medway Open Studios all fell on the same day, Saturday 12th July. As a result we joined so many other people for a spectacular Saturday. Our first part in this special day was a performance by Ginny and Maude. This time they were at the seaside for a hilarious adventure involving indecision, ice cream, Charleston dance and lots more! The Mayor was present and was amused to receive one of the very special comics drawn by Richard Squarecube. 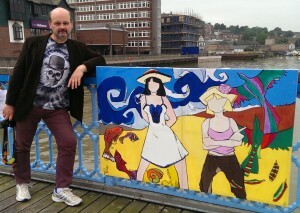 Richard is an artist based at Sun Pier House and, as well as his comic, his Ginny and Maude painting was hung on the pier and his Sirens of Cetham water colour could be found in the Big Dance green room. I’m so pleased our dance performances have inspired him so much! Next for us were dance workshops. I had just enough time to squeeze in an Active Armchairs workshop that I co-facilitated with Georgia. 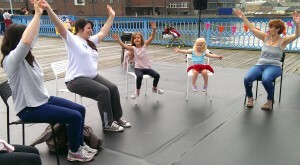 Active Armchairs in the sunshine, on the pier, beautiful! Georgia also lead a very popular Creative Dance workshop and fellow TRS Teacher, Alix was there with her dance company, AMG Dance, so she lead a workshop too! As if that wasn’t enough, we then entered The River Festival’s domain for a spectacular performance of The Sirens of Cetham. The promenade between Big Dance and The River Festival was long. 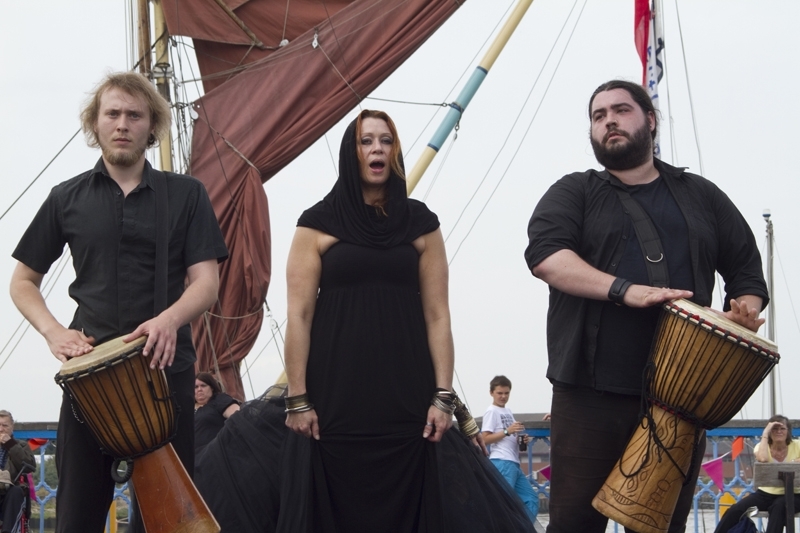 The sirens and musicians got tired in the hot sun, but it was well worth it as they collected the audience up with their haunting sounds and intriguing presence. Then I walked back as the promenade went back to Sun Pier and Big Dance for yet another performance. This time the audience had been warmed up by The Big Sing. 12 minutes later, and the final performance was over. Luci Napleton who organised Big Dance 2014 in Medway thanked everyone for coming. I would like to thank Luci for doing such a brilliant job and for including us in so many different ways. Throughout the day I did get a few chances to see other things that were going on. The water displays were especially exciting. A jets ski flipping record attempt and a man doing dolphin dives with water shooting out of his boots and propelling him into the air. There were boats and barges everywhere. The tea room in Sun Pier House was packed. 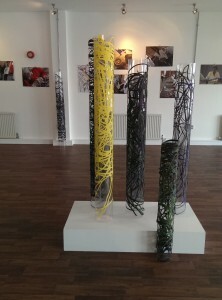 The Artists of Sun Pier House had multiple displays of their work as part of Medway Open Studios. In the Sun Pier House Gallery Kent Association for the Blind (KAB) and edna had an exhibition of art and photography. So much to see and do! I took lots of photos and video footage during the day and was pleased that my phone made an Auto Awesome, a video automatically made of randomly selected photos and video, very clever! So many people, organisations and mythical creatures featured, Big Dance, The River Festival, The Edith May, Silversmith Dance Theatre, Ginny and Maude, Richard Squarecube, Sun Pier House, Jacob Bride, Sophie Wophie, KAB, Active Armchairs, The Dance Community, Luci Napleton, AMG Dance, Medway Open Studios, edna, Dementia Friends, The Sirens of Cetham, Jet Stream Tours, The Big Sing and many more!